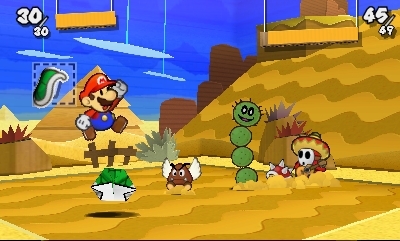 Paper Mario Sticker Star is the fourth game in the Paper Mario series that began on the Nintendo 64. This is the first time it jumps to a handheld platform, usually home to the Mario & Luigi RPG series. While the last Paper Mario game, Super Paper Mario (Wii, 2007), strayed from the classic RPG formula for more on a platformer-RPG jaunt, Sticker Star strays even more from what one would expect from a Paper Mario game. While some changes are welcome, it remains that many design decisions hindered the game’s quality rather than bolstering it. 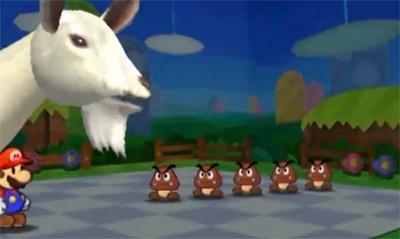 Paper Mario, now in 3D! Intelligent Systems has tailored this game to the handheld format: progression is broken up into stages, and auto-save and save points are abundant. NPC dialog is witty and entertaining, as per usual for this series, but there is little-to-no story and there is a severe lack of interesting characters to meet along the way. Everyone is from the Mario universe, be it a Toad or a Wiggler – there are no new characters; even bosses are familiar foes. You won’t hear much from Peach or Bowser either – both have minimal input on the game’s unfolding. This is disappointing, because there is ample opportunity to introduce fun new characters, and we’ve come to expect this from the series. The barebones story removes some of the motivation to progress in the game. I found myself often playing one stage at a time, because there was no incentive to see what happens next. Only familiar foes were recruited for this adventure. The battle system is quite unique. It is fast paced, turn-based and requires action commands to get the most out of your offense and defense. The hook is that you collect stickers along the way and use them as attacks in battle. Whenever you use a sticker, it’s gone, so it pays off to be a little bit conservative with the stronger ones. Stickers are in ample supply, and defeated enemies will drop additional stickers. I thought this mechanic was well done for the most part. Micro-managing your sticker collection is fun. However, it is impossible to target the enemy of your choice in battle. The only way to target an enemy other than the first in line, is to buy a power-up with coins, which will allow you to use more than one sticker on a turn. And even then, only the second sticker that you choose will hit the second foe in line, and so on. It’s somewhat convoluted, and for no good reason. I don’t know of any other battle system that restricts you from targeting specific enemies. Along the way, you’ll collect special items that you can turn into stickers for use in battle. These real-life items are a refreshing change of pace, and probably the most “surprising” thing about the game. These thing stickers are essential for some bosses, but the game doesn’t let you know beforehand. It may be obvious, once you’re in battle, but you might not even have the right stick in your book. Boss battles that aren’t approached properly can turn into long, drawn-out fights, decimating your sticker collection, due to the bosses’ high HP. Thing stickers are also required to solve some environmental puzzles scattered throughout the Sticker Star universe. Some are obvious, but enough of them are frustratingly not obvious, and will have you looking up an FAQ just to figure out how to progress. Thing stickers are always fun. Goombas gon' get stomped! You’ll probably be surprised to find out that there are no experience points in Sticker Star. No, there is no progression from weaker to more powerful, besides hidden HP upgrades. Only the stickers themselves get stronger versions as you progress, in line with the stronger enemies you’ll be facing. I found that there was a lack of sticker variety, with endless twists on the same sticker concept. You'll be using the same stickers to dispatch foes throughout the adventure, and it can get repetitive. Also, there are no battle partners, which would usually serve to spice up the battles with some variety, depending on who is by Mario's side. The design decisions of no experience points, no character progression, recycled stickers, lack of partners, and odd battle mechanics made it such that I would avoid battles more often than not. Sticker Star is a beautiful game, especially in 3D. Lively and full of colour, it is a pleasure for the eyes. The locales are varied, though predictable. In terms of content, it is fairly standard length, perhaps a bit on the short side for a Paper Mario game. There is no post-game content, and hardly any easter eggs. All in all, it is an enjoyable adventure game, but not memorable in any way, besides its interesting battle system. I expected more substance from Sticker Star, but what’s there should be enough to entertain a Mario fan looking for something different. Just don't expect to be blown away, as this is the weakest entry in the Paper Mario series to date. If you’re looking for an RPG, look forward to Mario & Luigi: Dream Team (3DS) this summer. Pretty well thought out review. The game is nice but you've pegged some rather significant flaws. Flaws that even deterred me a bit when normally I'm pretty easy to please. Thanks. I feel like Intelligent Systems may have had a bit too much on their plate with concurrently developing this along with Pushmo/Crashmo and Fire Emblem. Such that they did not foresee the problems that some of these new mechanics would introduce. I like that they took a side-grade and didn't make it another "Thousand Year Door". The sticker mechanic is fun, and the lack of needing to level up (finding stronger stickers instead) is refreshing. On the other hand, If we had gotten another "Thousand Year Door," then I could probably recommend it more than this. It's actually my favorite Paper Mario so far. I found the writing stronger and the locales and characters more charming. Most of the problems I had with the game, for instance the abundance of battles while you're trying to explore, are shared by all the games in the series, really. The puzzles were more obtuse in this one, but once you give in and look up a FAQ, then that problem disappears. I'm not as big a fan of Thousand Year Door as most people though. The thing is, they already took a side-grade and made Super Paper Mario, which was refreshing. Now that brings us to Sticker Star, which is further off the beaten path. I wouldn't call it refreshing on the whole, though perhaps the battle system can be considered as such. Another Thousdand Year Door wouldn't be a bad thing. That game, and its predecessor were superb. TTYD came out in 2004, and it's 2013. 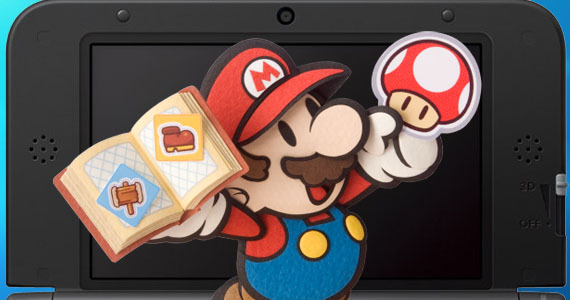 The next Paper Mario should be more traditional and have greater focus on story. What writing is there is good, but there's not much of it. Kersti's writing was nothing special, actually. She is a very predictable "companion". Her only surprising dialog is when she taunts you for sucking during boss battles. (Why couldn't you give me a hint of which sticker to use, you stupid brat). The abundance of battles wouldn't be a problem if you gained something from them (as you would gain EXP in previous games). The only thing to gain here are coins, which are useful, but hardly rewarding. And sometimes additional stickers, which are just to replenish your stock. My 3DS is still in the shop, but I really enjoyed what I played of Sticker Star. The optional battle thing is kind of weird. I'm not sure how I feel about it. I guess that it could be good, because people who enjoy the battles can seek them out, and everyone else can try to avoid them. I don't mind the lack of experience points. And the exploration is fun. I think there were actually a fair variety of stickers, although it's probably accurate to say that there was not much variety in stickers that are useful for any given battle. Especially near the end when they throw a bunch of enemies with a lot of HP at you at once, I just basically ended up heavily relying on red shell stickers... would just go buy up a bunch before every mission. At that point battles would take way, way too long if you just use the stickers that can only attack one enemy. I also really liked the way the levels were set up. Found them to have a lot of variety and creativity. Though I did miss the cool 2D / 3D stuff from Super Paper Mario. As for which game I prefer between this and TTYD, tough to say. Probably TTYD, but it's a close one. Good review, and pretty much my feelings, although I just couldn't get myself to beat the game. I left Mario as he was on the lookout for parts of the big Wiggler. Is it worth trudging through that part? For the record: I vote TTYD by far (unless something dramatically changes after Wiggler-mania). I'll play a game based on what I loved out of the previous title, but I make huge allowances for changes. Then again, this is the person who beat Chrono Cross, so I obviously have no taste at all. I liked Sticker Star a lot. Really a lot. Loved the writing and the visuals; I thought this one was tops in those two categories. I liked battling for the stickers you only get from certain enemies, and for money to help me fill in the museum. My favorite is either TTYD or the original Paper Mario, though, because this one was a little too RPG-lite to beat those out. That was my least favorite part of the game, and I can understand you dropping it at that point. It was simply a chore to find those Wiggler parts. I resorted to an FAQ. After you beat that section, the game opens up a bit, and I rather enjoyed some moments in the latter half of the game. I'd say it's worth it. @ploot The Wiggler hunt is definitely the slowest part of the game, so it is probably worth getting through it. It's not like anything AMAZING happens afterwards, but it goes back to a decent pace again. Having finished the game, I will say I wasn't expecting this game to follow the Paper Mario format as had been laid out in the N64 and GCN game, and as such I wasn't disappointed. I did not enjoy the game any less due to the lack of RPG elements either; this game simply offered a different way to play, and I really appreciated the strategies of using and losing stickers in battle. It is strange, as your review states, that you can't select which enemy you want to target in battle. I think I just accepted it as one of the rules of battle and changed my strategy accordingly. But yeah, I can see how that could be a turn-off. My complaint is there are just too many Thing stickers, and the worst part is you can't simply keep all of them in stock in your sticker album due to limited space. What this means is going back and forth to one of the Toads to fling the objects and convert into stickers, then heading back to where you think you need them and hope they work. I will say, though, using the Thing stickers was always a blast. It's hilarious some of the stuff they do, both in battle and out in the field. The sticker concept is definitely fun and novel, and I can see it being improved and fleshed out even further in a sequel if there happens to be one. I don't think I used all the Thing stickers in combat...I may have just figured out what I'll be doing while waiting for Animal Crossing to be released.